“Crystal Mines” is the level artifact for my master's thesis: "Understanding Japanese Design Philosophy: Designing a Zelda-Styled Dungeon." As such, the level focuses on environmental puzzle-solving, combat and navigation , all culminating in a climactic encounter with the dungeon boss. The player controls Alyx and begins with only a crowbar, eventually obtaining the fire crossbow and uses it to solve puzzles. This level utilizes multiple techniques from existing Zelda dungeons to craft the classic Zelda player experience. Alyx explores a room in the Crystal Mines. Zelda Design Techniques: Utilized several Zelda philosophies including specific player training, intensity ramping, variety, conveyance tricks and the use of a central atrium room. Climactic Boss Battle: Concluded the player's dungeon experience with a one-on-one battle with a massive mine cart boss, the Iron Dragon. The battle tests both the player's puzzle-solving ability and dexterity with their new fire crossbow weapon. The battle includes a short cinematic introducing the boss and its unique mechanics. Item Acquisition: Placed items across the dungeon to reward exploration and used them to create good level flow. The player collects keys and the fire crossbow through their adventure. Systems Design: Converted a first-person shooter engine into a third-person action-adventure level. This required setting up a custom camera along with a first-person aiming mode, setting up character animations, scripting four door systems, melee and ranged combat and custom gib spawning. One of the best ways Zelda teaches players how to use new items is by locking them in a room and forcing them to solve a puzzle before being allowed out. 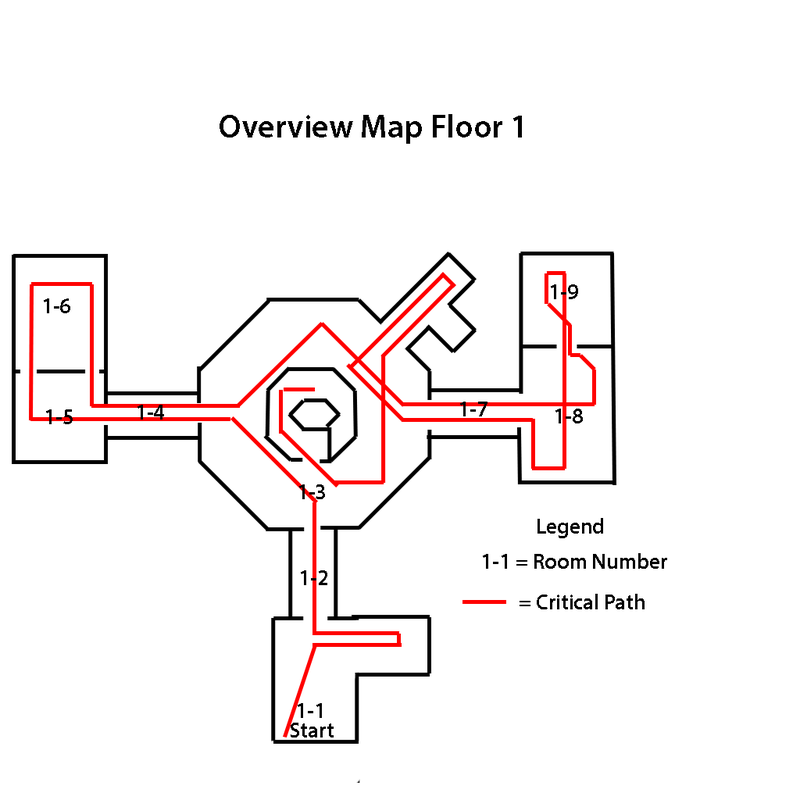 This prevents players from aimlessly exploring the dungeon in search of something they missed when they simply haven't thought of the correct solution to the puzzle in front of them. "Crystal Mines" forces the player to light an unlit torch before leaving the room where they obtain the fire crossbow. This technique is also used in the room before the boss that teaches players to shoot certain objects to destroy them that appears a minute later on the boss's mine carts. Variety is one of the core methods Zelda uses to prevent player fatigue. This includes mixing up sections of puzzles with combat as well as individually mixing up what the actual combat and puzzle challenges are. The level includes platforming puzzles, combat with zombies, anltions and a mine cart boss, and torch puzzles to keep the player engaged. 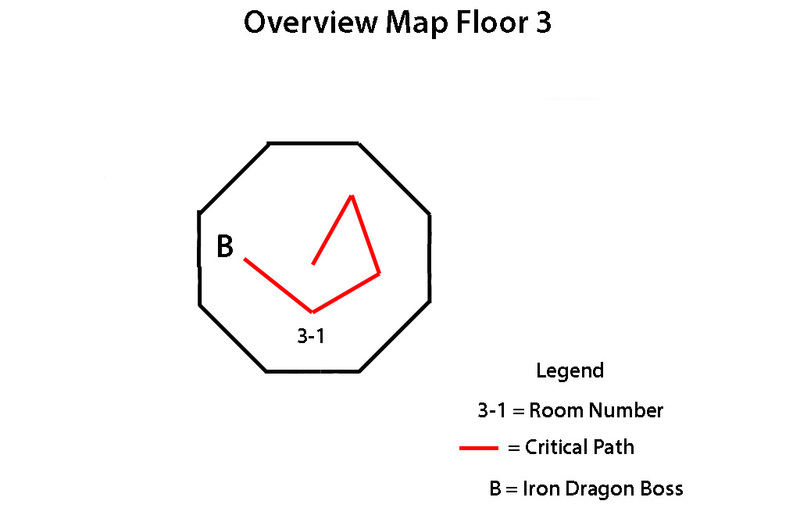 The Iron Dragon from "Crystal Mines"
Central Atrium rooms act as a hub for the player to navigate back to when lost or confused in order to gain a sense of direction and purpose. The atrium in "Crystal Mines" includes both the boss door to tease players with an area they want to go to in addition to the boss key itself, so that they are in a position to find the final key when heading back to the atrium room. This creates positive serendipity when the player finds the last puzzle in the atrium instead of backtracking through every room for the one thing they missed. The Central Atrium Room. In front of the Alyx is an ice wall that is impenetrable without the Fire Crossbow. As both a reward and a final test of the skills the player recently learned, Zelda dungeons end with an epic boss battle. Continuing in this tradition, "Crystal Mines" concludes the player experience with a battle against the Iron Dragon, a massive mine cart boss. The player proves their skill with the fire crossbow to light torch-activated stop beams that inhibit the mine cart's motion. Unlike in previous puzzles where the player only had to ignite the torch and move on, here the player has to time lighting the torches as the Iron Dragon approaches them before they extinguish. 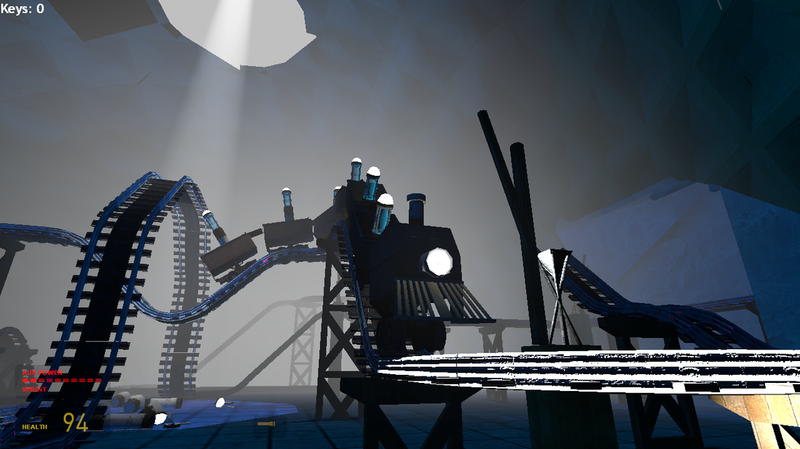 After successfully stopping the mine cart, the player then has to quickly shoot the train before it resumes motion. This combination of testing advanced puzzle-solving and dexterity is typical of Zelda boss battles. One of the best ways to determine progress through a Zelda dungeon is how many and which items you have collected. "Crystal Mines" includes keys, a fire crossbow and the boss key. Players enjoy getting items and begin to anticipate future challenges and goals based on the items they have. For example, when a player finds the fire crossbow, they are going to begin imagining what it can do while scouring the dungeon for ways to use it. In order to capture the Zelda experience, certain systems had to be scripted given what was included in Half Life 2: Episode 2. Something as mundane as how doors work has a critical impact on level flow and player experience. 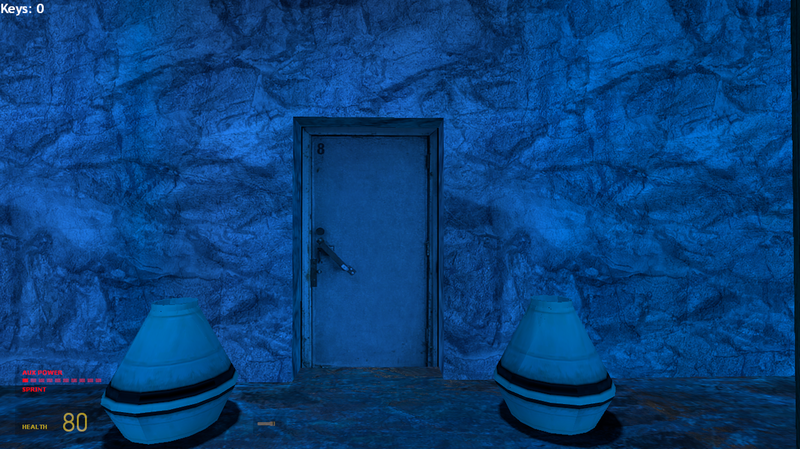 "Crystal Mines" includes four door types: unlocked doors, locked doors, barred doors and boss doors. Unlocked doors are the same as Half Life 2 ones, simply approach and open them. Locked doors require a key to open them and are decorated with chains and a lock to communicate this. 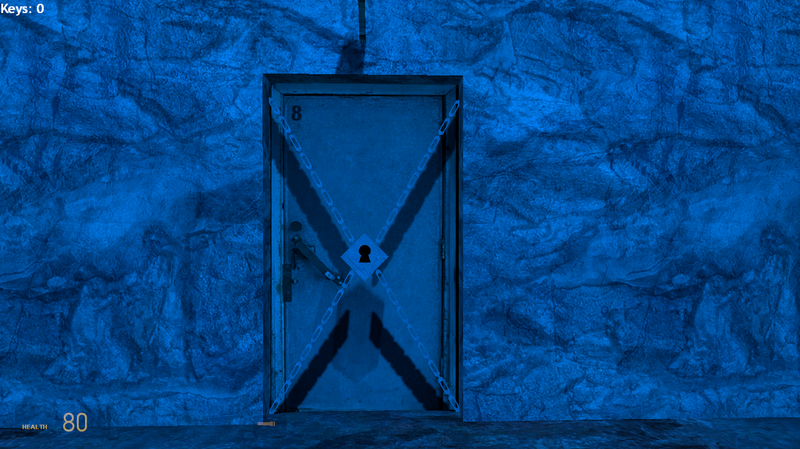 Barred doors have four metal bars that prevent the door from opening until some action triggers it, such as eliminating all the enemies in the room. 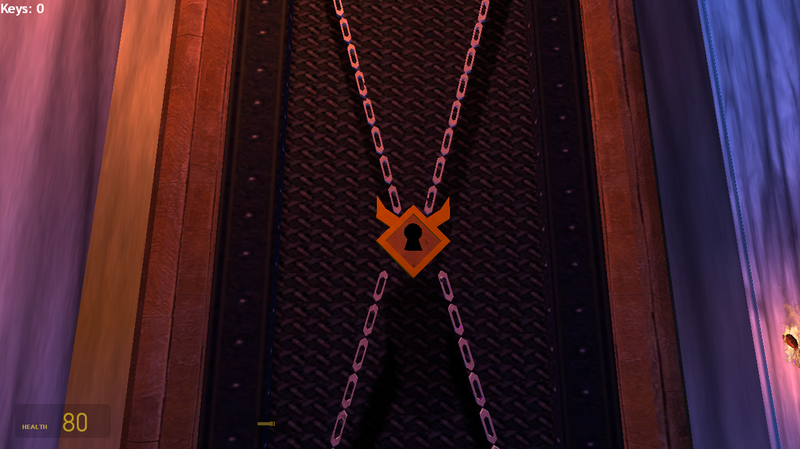 Boss doors are like locked doors but only open to the boss key. They are also decorated in a similar fashion to locked doors but are larger, more detailed and include gold coloring to indicate its special nature. Perspective is an important part of any game and Zelda is no different. 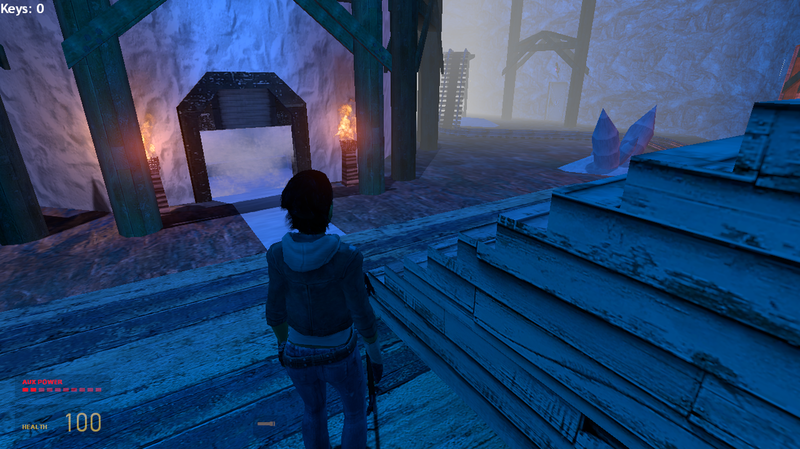 A third-person camera is crucial to giving players the field of view they need to see the level and solve puzzles. However, a first-person camera is necessary to letting players accurately aim the fire crossbow at moving targets like the Iron Dragon boss battle. "Crystal Mines" includes melee combat with the crowbar and ranged combat with the fire crossbow. 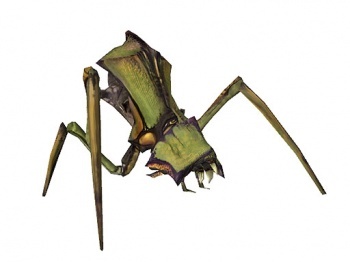 Because Alyx is not a playable character in Half Life 2, combat had to be scripted from scratch instead of simply equipping her with a weapon. When one weapon is in use, the other had to be disabled. Because environmental interaction is so key in Zelda design, it was important to allow the player to destroy some of the custom meshes I created for the level. Half Life 2 only automatically supports generic material-based gibs, like wood, stone etc., which meant I had to create all the broken parts of the crystals and pots that the player could break and then script instances of them to later spawn once the object was destroyed. For a more detailed room-by-room analysis, download the thesis paper at the top of this page and check out the Detailed Design section of the Level Abstract in the appendix. 1-1: Teaches basic platforming, moving platforms, locked doors, treasure chests and keys. Contains a key. 1-2: Teaches bottomless pits and basic melee combat. 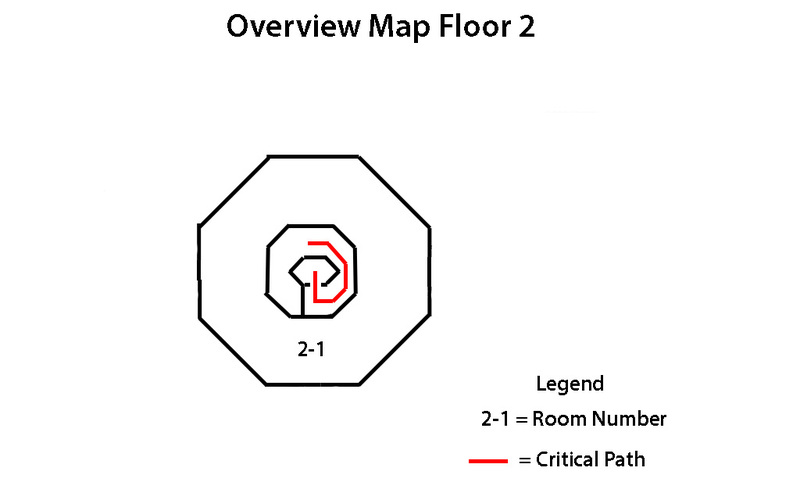 1-3: Floor 1 of central atrium room with multiple possible paths, with some initially inaccessible. Contains Boss key. 1-4:Reinforces platforming, bottomless pits and melee combat. 1-5: Includes intensity ramping of basic moving platforms. Introduces barred doors. 1-6: Includes intensity ramping of melee combat. Contains a key. 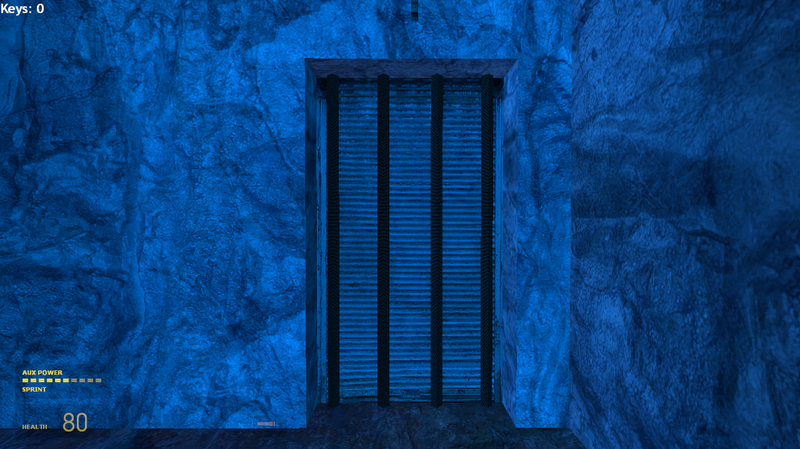 Barred doors lock the player in until all enemies are defeated. 1-7: Reinforces basic platforming and bottomless pits. 1-8: Tests advanced platforming and teases player with paths they cannot go through immediately. Preludes torch puzzle. 1-9: Tests melee combat. Contains fire crossbow. Teaches that fire crossbow ignites torches. 2-1: Floor 2 of central atrium room. Teaches a mechanic for the boss battle. 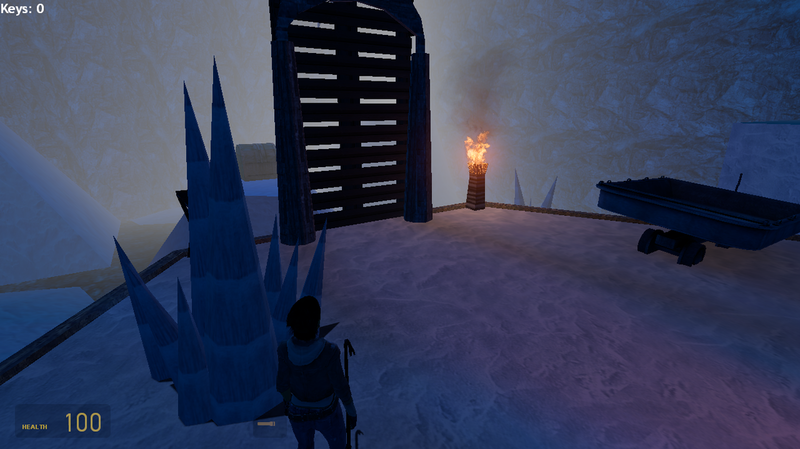 Boss door blocks entrance to central ice pillar. 3-1: Dungeon Boss Battle with the Iron Dragon, a long train that travels along a mine track shooting at the player. Reinforces and tests new usages of familiar techniques. Clear player experience goals: I have a lot of experience with Zelda games and understood from the beginning what makes them have such a powerful impact on players. Sound design: I left time at the end of the project to find and implement the correct music and sound effects to put players in the right mood for the level. This proved to be worth the effort as the sound design was highly praised. Tools learning: In order to create a Zelda level in Half Life 2 without touching code, I had to deeply understand the scripting systems in order to create system-wide changes like dynamic camera changing. Additionally, I had to figure out how to use an old third party software program called Propper in order to create meshes for the level. I was successful in quickly learning and find information to implement my designs. Boss battle design: I never had a clear vision for how the player experience would work for my first boss idea. I had to change it towards the end of the project from an Antlion Guard to the Iron Dragon which ended up working very well. Janky animations: Alyx was never designed to be a playable character in a third-person game and I am not an animations programmer, so I had to maximize the value of my effort in scripting animations for Alyx's actions. Eventually, I just had to let it be, especially since it is not the focus of the thesis artifact. Unsolved bugs: Due to the dramatic scripting turning Half Life 2 into Zelda, there are some bugs that I would need code to fix and are unsolvable through Source's entity scripting. Believe it or not, programmers are extremely useful! Simple gameplay does not mean easy to design: I knew before I even started that Zelda design was not easy, but I still underestimated how difficult and how many nuances make up the entirety of the Zelda experience. Visuals help make good gameplay fun: Much of my core design remained unchanged from concept to final version, but the enjoyment of the level drastically increased once I started making meshes to enhance the player experience. Simple does not mean boring: For awhile, I was dismayed by the simplicity of the first floor's design as being simple to the point of boring. However, testers found the pacing and intensity ramping of the level to be enjoyable.